The August edition of the celebrated Guest Writer Session inadvertently coincided with the national convention of the Peoples Democratic Party (PDP). Given the over-zealous security lockdown associated with the latter’s events, there was a lot of anxiety as to whether the Guest Writer Session would hold. But in keeping with the age old show business maxim, the show did go on albeit over an hour behind schedule. Numero Unoma, psychologist and photographer, exhibited captivating images of scenes in Lagos and Abuja from an on-going series. The amazing thing about her images is that they are pictures familiar places, but taken in such a creative way to bring out completely new perspectives. She presented a graphic narration of how life goes on around the popular Lagos Civic Centre on Ozumba Mbadiwe Drive, captured from the towering heights of the famous 1004 apartments. It was intriguing to watch the first signs of daybreak, the gradual build up of human and vehicular traffic on the road and the resumption of full commercial activities, all captured in still images. Indeed, in her exhibitions, the audience watched what life is like on a typical day around that vicinity, from daybreak to sunset. Another intriguing aspect of her pictures was how they captured the several weather changes that a typical day in Lagos witnesses. One moment, the weather was bright and sunny and in the next, a mass of clouds was seeing gathering and then a downpour and the sun was back all in very brief moments. These are common natural occurrences but to watch them unfold in a sequence of bright, clear and beautiful still images is a testament of the genius of the mind working behind the camera. Her images of Abuja focused around the National Mosque and were no less graphic and intriguing. With Tope Fasua, it was a swift progression from the world of photography to that of business and economics. An economist,accountant, financial consultant, prolific columnist and blogger, Fasua read from his latest book, Things to do before your Career Disappears. Like Unoma, he painted vivid images for the audience, only his were the grim pictures of the threat globalization poses to the economic survival of people in the developing world. He cited Nigeria’s dependence on a single commodity for foreign exchange earnings, its import-dependent economy and the inability of the leaders to respond adequately to the looming threat to the country’s economy as the greatest risks, which if not mitigated, will spell doom for the country in the near future. Employing his deft knowledge of economics and oratory ability, Fasua broke down into simple terms the economic jargon that often makes the understanding of its terms and concepts a mystery to most people. He explained the gains of globalization such as the ease of communication, spread of information and attendant opportunities for personal, economic and social integration and development. But he said globalization, like every human concept, has its great disadvantages, especially for developing economies like Nigeria. where businessmen prefer to take their jobs to China, and the consequence is that from far away China, a big corporation can stretch its arm and take away the job of a small scale manufacturer in Nigeria. He said there must be limits to the extent which government allows imports as total liberalization will kill the country’s struggling manufacturing sector. Fasua also decried the high cost of governance in the country. He described the situation where a Nigerian legislator earns many times more than the presidents and primes ministers of countries with even better economies as scandalous and a situation that demands for stiff resistance from the people. Answering questions from the audience, the economist lamented the frustration of talking when no one is willing to listen. He said as an individual, there is a limit to where he can take his efforts to help the Nigerian situation. He advocated a crash in the cost of governance, the strengthening of our local technology, a halt in government borrowing and also advised Nigerians to cultivate the culture of saving and wise spending. and delivering messages in ways that are easy to grasp and that he did not fail to prove in his reading. The highlight of his presentation was a short story he read titled, ‘A Lust Intervention,’ in which he employed the tools of humour, imagery and wordcraft to such heights that drew loud applause from the audience. Agema said his writing is inspired by his Tiv roots from which he draws most of his linguistic artistry. He writes across the major genres, and is an editor as well as development and cultural enthusiast. He has a love for Post-Colonialism, African Literature and New Writings. He is the Vice Chairman, Association of Nigerian Authors (ANA, Benue Chapter); is an alumnus of the Benue State University’s Writers’ League and a member of the Abuja Writers’ Forum. He is also the team leader of SEVHAGE Literary and Development Initiative. The presentations elicited a lot of responses from the audience who were also treated to some musical interlude by two guitarists, Chukwu Echefu and Tokunbo Edward. There was a presentation of certificates to participants of the intermediate class of the forum’s Creative Writing Workshop. Winners of the forum’s monthly writing challenge were also presented with their prizes and a raffle draw was conducted with members of the audience winning book prizes. 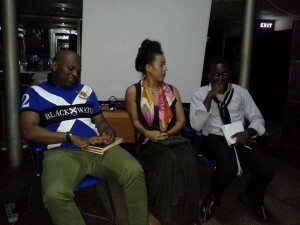 The audience left at the end savouring a deft mélange of photography, politics and poetry, ensuring the Guest Writer Session continues to live up to its reputation of a dynamic platform for celebrating the vast spectrum of Nigeria’s creativity. Elvis Iyorngurum is a poet, Editor with 2Feet Africa and the Secretary of the Abuja Writers’ Forum. He writes and works in Abuja, Nigeria.